Beautiful designs that have no seams or very little to sew. (Knit or Knit+Crochet) Packed with beautiful details. (Knit) Effortlessly chic and stylish with eye-catching lace border. (Crochet) Customize length of sleeves and body as you like. (Crochet+Knit) Effortlessly stylish and feminine with eye-catching crocheted floral lace. (Crochet) Oversized cardigan with effortless sophistication. Flattering for all body shapes. 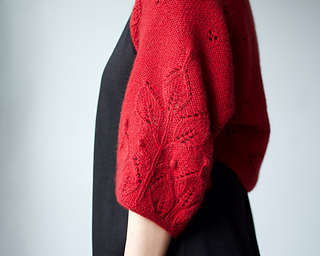 (Crochet) Makes a twinset with the matching Arianna cardigan. (Crochet) Looks just as elegant and feminine with short sleeves. (Crochet) Flattering for all body shapes. (Crochet+Knit) Feminine floral lace yoke lends elegant details to this chic top. (Crochet) Adorable baby cardigan, can be made with long sleeves.